Learn how to get ahead in the job search. Photo courtesy of Shutterstock. Are you a recent college grad trying to figure out how to best market your skills and fit your job search into an already busy life? Are you concerned that it’s summer and you’re still trying to find a paid internship? Are you wondering how parents can appropriately – or inappropriately help your job search? Are you a female college grad who aspires to become a leader in your field? If so, then read on. Because we have tips and advice for all those questions – and more. Many recent college grads simply read job ads and send in resumes, without a plan. 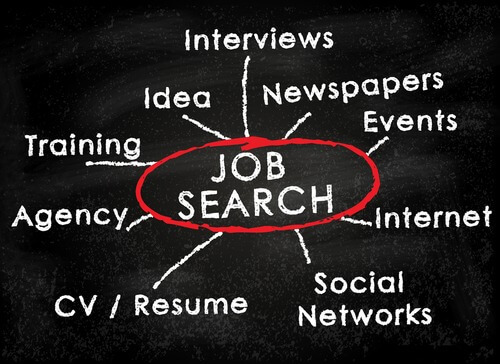 Francis says coming up with a job search plan, which includes a list of requirements one would like in a particular job/field, can help created a more focused job search, and target specific jobs or employers. Making a chart that outlines previous experience – part-time jobs, college coursework, clubs or organizations, project work, or previous internships, and jotting down successes from those experiences can help a job seeker realize the successes they have, and then, when they understand those successes, they can start perfecting how they discuss them with employers. Don’t think that part-time college job in retail or the restaurant industry, or other field, matters? Think again. “Check back in with previous managers and colleagues to brainstorm all the things you’ve done and skills you’ve developed that may allow you to feel more confident in your abilities,” says Francis. Once you have a clearer sense of your own experiences, what you desire in a job, company and what job titles to look for, now you can start your search. If you start before then, you’ll be wasting time. Meet with a career counselor at your college or university. Even if you have graduated, these professionals are here to assist with job search tips, connecting graduates to a mentor, interview prep, and more. Post on social media that you’re seeking a paid internship in data science. “The more specific you are in your request, the better your networks will be able to help you,” says Francis. The key is to be as specific as possible, no matter the industry/career one is pursuing. Check job boards to search for internships and job like College Recruiter, recently named #1 job search site for students and recent grads. Use LinkedIn to connect with your school’s LinkedIn alumni group, and see where students or current alums are interning, or currently working. If there is a connection at a target company, reach out to that person and connect. Once connected, start to develop a relationship. Don’t make it all about your needs, and be willing to return any favors to help the new connection. Eventually though, the goal should be to meet with these connections to conduct informational interviews. It’s easy for recent college grads to be timid in the job search. That’s only natural. In addition to writing a great resume, practice interviewing, conducting mock interviews (many college career centers also offer these services), informational interviews, or getting involved in networking events and industry associations can help a recent college grad develop confidence in the job search. Many people are timid or fearful because of the newness of being in the job search for the first time. Getting involved and becoming active can help recent college grads develop confidence over time. In addition to working with career development professionals, recent college grads could also consider working with a career coach. “Figuring out where your low confidence is coming from is essential in determining how to overcome this,” says Francis. The first steps to marketing your skill often starts by understanding what employers want. Unfortunately, in some instances or fields, women need to figure out how to get past male-sounding job descriptions. In addition, many female college grads may be timid if they are not finding other females, or leaders, within their chosen field, to learn from. This is where networking, or finding organizations/opportunities to volunteer or participate in industry-related events can help make connections and open doors, while also building career confidence. For example, a new grad seeking a data science career may not know where to find a female data science mentor or leader. In a previous College Recruiter article, 6 rules for women who want to become corporate leaders, Greenwell said some job seekers, especially those just starting their career, focus on job titles versus opportunity. Don’t sacrifice doing what one loves for the sake of a title. Instead focus on the work itself. Many college grads have parents who are ready to help their child with the job search. That’s great, if done correctly. The main thing to remember is, this is the real world now, and employers expect recent college grads to take initiative, and own their career/job search. Read this article to learn how helicopter parents hinder college grads in detail. “Although most parents mean well with their efforts, they need to know where to draw the line to avoid hurting their son or daughter’s chances of securing a job,” says Britton. Anyone can learn from a mentor. However, there are students who can especially benefit by having a mentor help tap them into a network that might normally be just beyond reach. For example, some studies show that entry level women with a mentor show faster career growth than women without mentors. How can one find a mentor? “Think about past professors, staff at your school who have supported you, or maybe a new contact – someone you admire in your field,” says Francis. “Set up a meeting to ask for help and tips on how to market yourself.” And when you land that first job, ask if the organization’s has mentorship program. Once the resume is mailed in, take it even further. Another option to consider? Build your own web site. It’s a built in marketing tool. “Building your own website is another interesting marketing strategy,” says Greenwell. “There are many tools available to build your own in a cost-effective and simple manner. This is a good way to display your experiences and interests, and to bring your resume to life. Highlighting educational accomplishments, learning adventures and volunteer experiences is critical. Aside from email, phone and a link to your LinkedIn profile, other personal information should be omitted. It’s normal for recent college grads to fear the unexpected, or not know how to approach the job search soon after college. Follow these tips, and over time you will become confident, connected, and in time, hired! Want more career advice and job search tips? Then stay connected to College Recruiter by visiting our blog, and connect with us on LinkedIn, Twitter, Facebook, and YouTube.